SweetStamps BLOG: Two Stencils, One Background, Say What?! Two Stencils, One Background, Say What?! 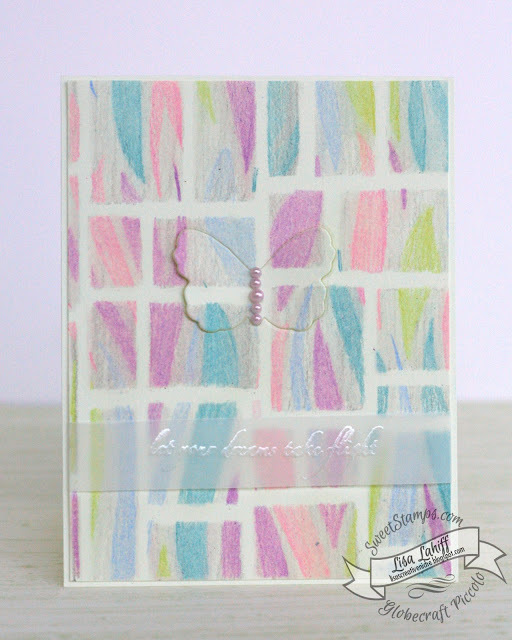 This card was created using two stencil at one time to create this fun and lovely background. How'd I do that? Well I started by layering my stencils on top of each other and my cardstock. My Kitchen Floor stencil went over the paper and then layered it with the Abstract Stencil on the top. To hold them all in place I used wash tape around the edges. I then began tracing over the top stencil (Abstract stencil) with my colored pencils in various colors. Once I had colored the whole thing I removed the top stencil and colored in the open areas of the second stencil (Kitchen Floor) all with a grey colored pencil. When this was finished I removed that stencil and finished my card by die cutting my butterfly and adhering it back in, adding pearls, and my sentiment embossed on vellum. I hope I've shown you a new technique or maybe some new tips on how to get the most from your stencils. Awesome idea, I love the design you made using the double stencil layers.